Former Governor Arnold Schwarzenegger met with His Holiness Pope Francis after the general audience at the Vatican on Wednesday. 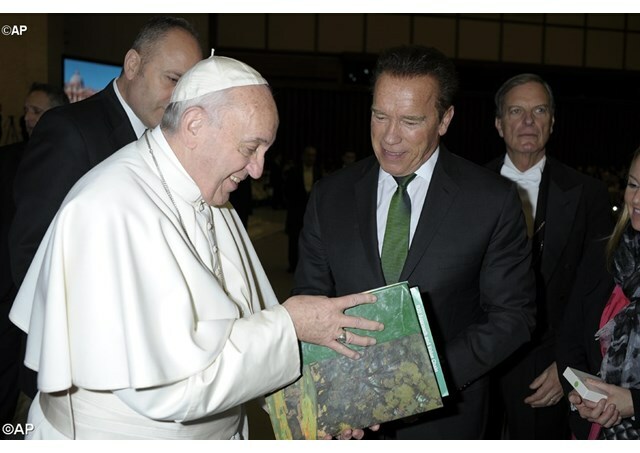 Mr Schwarzenegger thanked and congratulated Pope Francis for the Laudato Si’ Encyclical Letter on the Environment published May 24th 2015. Mr. Schwarzenegger presented to Pope Francis the environmental and energy efficiency legacy achieved by the the state of California under his two terms as Governor, emphasizing that one of the most immediate concerns of populations around the world was that of air pollution, which is killing millions of people every year. (The number-one cause of death in developed countries is from fossil-fuel emissions, and in developing countries it is emissions from coal and wood-burning cook stoves). Mr. Schwarzenegger also presented his environmental NGO, R20 Regions of Climate Action. Mr. Schwarzenegger was joined by R20’s Executive Director, Mr. Christophe Nuttall, who presented the Pope with R20’s Green Faith in Action initiative. This pioneering initiative is working with mayors of pilgrimage cities and religious leaders to transform cities that welcome millions of pilgrims each year into shining examples of the green economy. Mr. Schwarzenegger and R20 look forward to exploring how to work together with the Vatican to accelerate communication and action on climate change.